OXON HILL, Md.—More than 400 young hopefuls were still competing on Wednesday as the Scripps National Spelling Bee entered its second day, with some using memory aids such as tracing invisible words onto the back of their nametags as they strived for the $40,000 top prize. 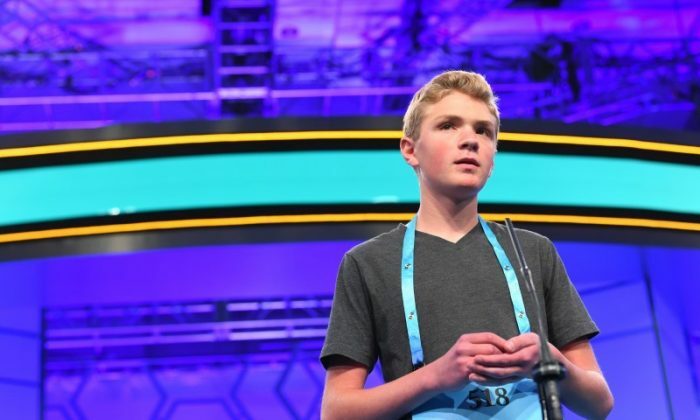 “I’ve been training for about two months,” said Robert Foster, 12, of Kensington, Maryland, who successfully spelled the word “intertribal” to advance to the next round on Wednesday. Foster correctly spelled “pratincolous” on Tuesday, and sparked smiles from fans when he struck a dab pose – a dance move that involved tucking his head into his elbow as if sneezing while sticking his other arm straight out to the side – which he says was a dare from his older brother. “My brother said that he was joking and he didn’t actually expect me to do it,” said Foster. He admitted to having “no idea” as to the meaning of “pratincolous,” an adjective that describes creatures that live in meadows or grassy areas. Foster was among the 452 youths still spelling on Wednesday morning from a starting field of 516. This year also marks the first time the child of a previous champion has competed in the national finals. Atman Balakrishnan, a 12-year-old from Chicago, hopes to follow in the footsteps of his father, Balu Natarajan, the 1985 champion. Natarajan, now a sports medicine doctor, was 13 when he won. The 2018 competition includes 45 spellers with relatives who are former contestants in the national championship. The 91st annual Bee, which began Tuesday and ends Thursday evening, also includes its first-ever identical twins – two sets of brothers from Utah and Mississippi. A record 516 spellers traveled to Oxon Hill, Maryland, to compete for the crown this year. Students hail from the United States and eight foreign countries, winnowed from 11 million hopefuls who competed in preliminary competitions at schools around the world. Contestants, aged 8 to 15, are 46 percent female and 54 percent male, according to the contest’s website. They will have to spell words drawn from the 470,000 entries in the Merriam-Webster Unabridged Dictionary. The winner of the $40,000 top prize will emerge from the finals on Thursday night, with a worldwide audience tuning in to the live broadcast on ESPN. The E.W. Scripps Co, which owns television and radio stations, runs the Bee on a nonprofit basis.